As of 2017, there are over 600,000 bridges in use in the United States. Almost 9% of these bridges are classified as structurally deficient, which means that the condition of the bridge includes a significant defect and restrictions must be enforced to maintain its safety. Though a structurally deficient bridge is not imminently dangerous, it can become so if substantial improvements are not made. The average expected lifespan of a bridge is 50 years, but around one in four bridges in the U.S. are older. To help ensure that bridges (young and old) are structurally sound and safe to drive over, they need to be inspected regularly. To help them ensure that bridges remain safe, inspectors rely on different nondestructive testing (NDT) techniques. Though functional, traditional NDT methods are not the most efficient and dependable. With modern ultrasonic testing, however, inspectors can do their jobs with improved data and more reliable information. On average, 174 million trips are made across structurally deficient bridges each day. Over the course of a bridge’s service life, the constant loading and unloading of weight on the structure can cause cracks and shearing to form in the welds and bolts that hold the bridge together. If left to grow, these flaws can lead to catastrophic failure. To prevent this from happening, it’s important to find defects such as corrosion and fatigue cracking as quickly and efficiently as possible. The various defects and discontinuities possible in a weld. Welds and bolts joining together bridge steel supports are particularly susceptible to discontinuities that can lead to corrosion and cracking. For example, when the weld doesn’t fully fuse with the steel or trapped gas creates holes in the weld, the strength of the weld is lessened. 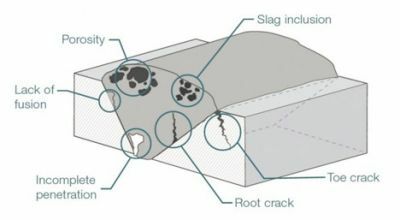 A bolted connection can be weakened by shear stress, which occurs when the two fastened structures are forced in opposite directions. These weak areas create concentrated points of high stress from which fractures can originate. A traditional NDT method used to inspect bridges is liquid penetrant testing (PT), in which liquid dye is used to reveal surface cracks on welds. Though PT has few material limitations and is relatively inexpensive, it’s limited to detecting surface cracks, leaving subsurface cracks undiscovered. Furthermore, to use PT, the inspector must have direct access to the surface being inspected, and surface roughness can affect the inspection sensitivity. Radiography is a conventional NDT method that can also be used to inspect a bridge, but inspectors are slowly phasing it out. Radiographic testing uses X-rays to create a photographic film of the weld/bolt’s internal structure and determine if any discontinuities exist in the bond. However, this method carries safety risks because it emits radiation and generates chemical waste material. Additionally, it requires supplementary licensing and areas in proximity to radiographic testing must be cleared. Phased array ultrasonic testing (PAUT) offers a safe, reliable alternative to PT and radiography that provides a better quality of data. A phased array flaw detector uses a probe to send high-frequency sound waves into the bridge supports. If a flaw—such as a crack or corrosion—exists, the probe will detect the altered sound waves. The data is sent back to the flaw detector, which then translates it into a visual representation that an inspector can use to identify the defects. Another advanced NDT method that inspectors use is eddy current (EC) testing. Eddy current is used to help detect subsurface cracks that penetrant testing can miss. A major advantage of EC is that, unlike PT, it can be used on painted or coated surfaces. This helps save time and reduce cost since there’s no need to remove coatings or paint prior to inspection. Welds can be inspected without removing paint with eddy current testing. Today, more than 54,000 bridges are older than their expected lifespan and are due for restoration and/or replacement, an undertaking that would take thirty-seven years to complete. To maintain the safety of the bridges we cross each day, bridge inspectors need to be able to determine any defects that would require load restrictions, making PAUT and EC flaw detectors are excellent alternatives to radiography and PT.